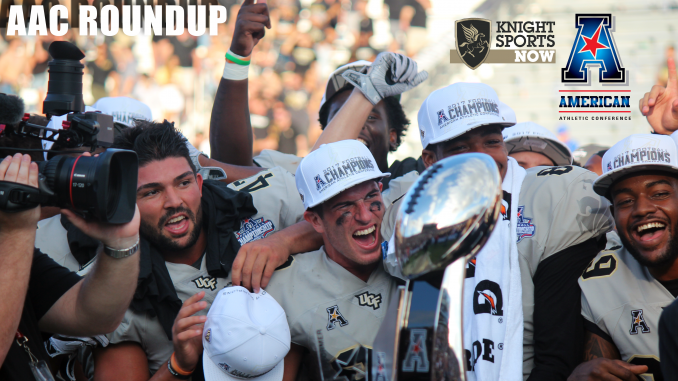 UCF closed out the 2018 regular season on Friday with a 38-10 road win over South Florida, but the victory was largely overshadowed by quarterback McKenzie Milton’s devastating leg injury. Despite Milton going down, the Knights (11-0, 8-0 AAC) moved up to No. 8 in the latest College Football Playoff rankings before they head into Saturday’s AAC Championship Game against Memphis. Before we get to that game, let’s check in on what else went down around the AAC in the final weekend of the regular season. After a chaotic regular season, the 2018 AAC Championship Game will be a rematch of last year’s. Just a couple of weeks ago, four teams had a shot at winning the AAC West. Memphis, the preseason favorite to win the division, ultimately emerged as the winner. UCF, which won the AAC East, was waiting on the winner of this past weekend’s game between Houston and Memphis. The Tigers came out on top and, despite a 5-3 conference record, will be representing their division in the conference title game. The Knights and Tigers will be meeting for the fourth time since the beginning of the 2017 season. UCF won the first meeting in Orlando, 40-13, before winning last year’s conference title game 62-55 in double overtime. The two teams met in Memphis earlier this season, with UCF coming back from a 30-17 halftime deficit to win 31-30. As for the rest of the conference, there were some surprises on the final weekend of the regular season. Navy gave Tulane a scare, but the biggest shock came from SMU. With their loss to Tulsa, the Mustangs went from controlling their destiny in their division two weeks ago to missing bowl eligibility completely. Overall, the AAC has seven bowl-eligible teams.